Why don't my CCBill paid orders show up on my 3dcart Store? When using CCBill as your payment gateway, you may receive notification from your CCBill account of an order being processed but it does not appear in your 3dcart store. To correct this, you will need to specify a "callback URL" on your CCBill account that redirects the purchaser back to your 3dcart store. This callback process finalizes the order and sets it as "New" on your 3dcart store so you can process and ship the order to your customer. 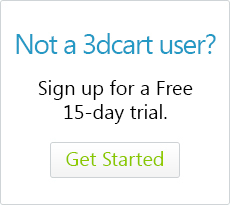 Be sure to use your 3dcart's store secure URL. If you do not know your site's secure URL, log into your 3dcart Online Store manager and navigate to Settings ->General ->Store Settings, and look for the Store and Secure URL fields to see this information.